Need some last minute gift ideas? 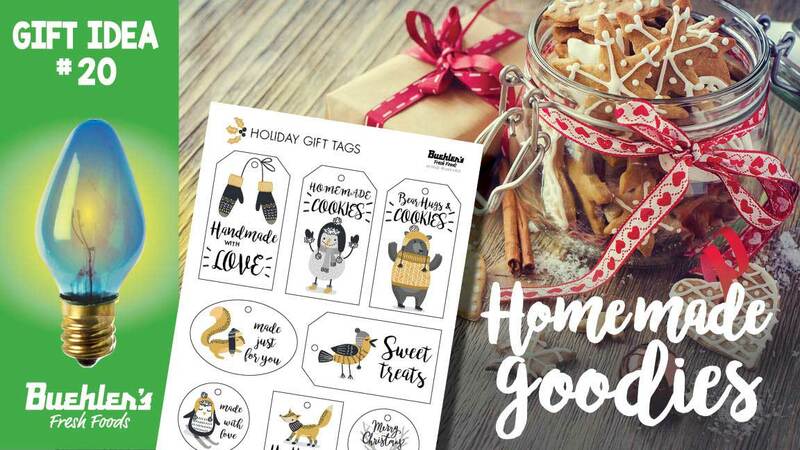 Here are 30 ideas… And best part about our ideas – you can pick them up at Buehler’s when you’re doing your grocery shopping. Talk about time savers. We have something for everyone! 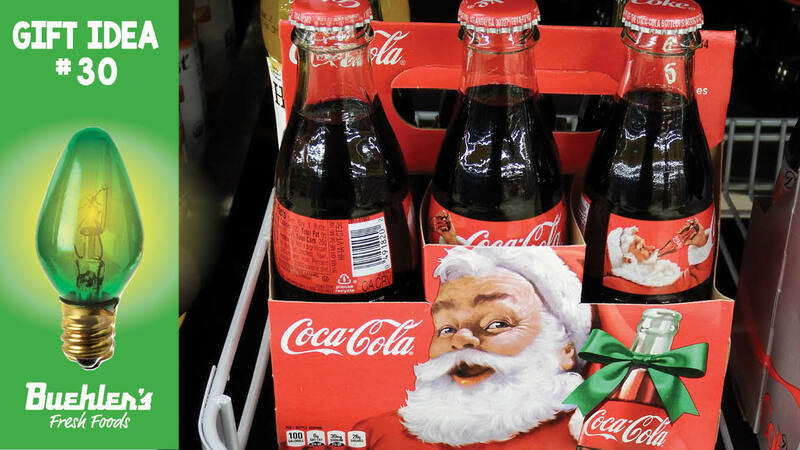 Coke is a Christmas classic, and a fun, unexpected gift! 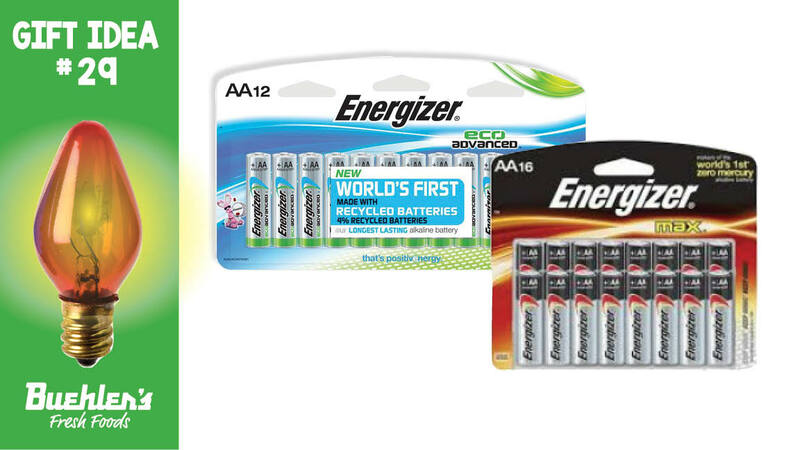 Just in case the elves forget to include batteries – it’s always good to have some in reserve! 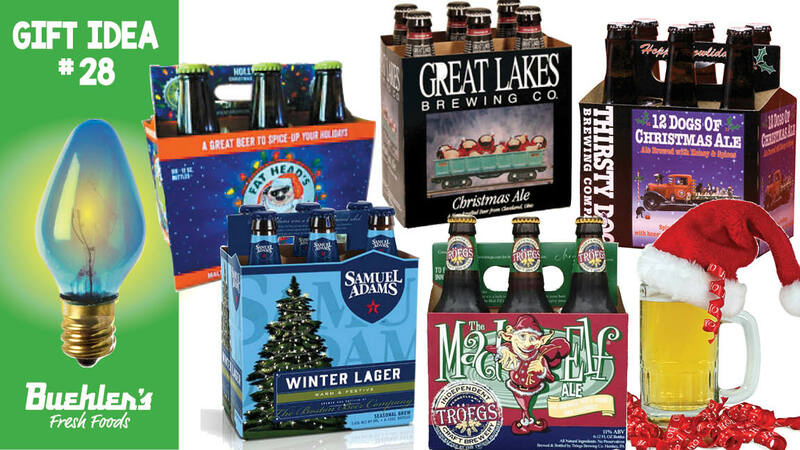 Brewed just for the holiday season, Christmas beer is a great gift for the beer drinkers on your list. Our Craft Beer Department has a collection of everyone’s favorites! They won’t be around long…. Gift Idea #27 – Candy! Does Santa put candy in your stocking? Children love these fuzzy critters and our floral and gift shop has a wide variety of cuties. What was your favorite stuffed animal from your childhood? 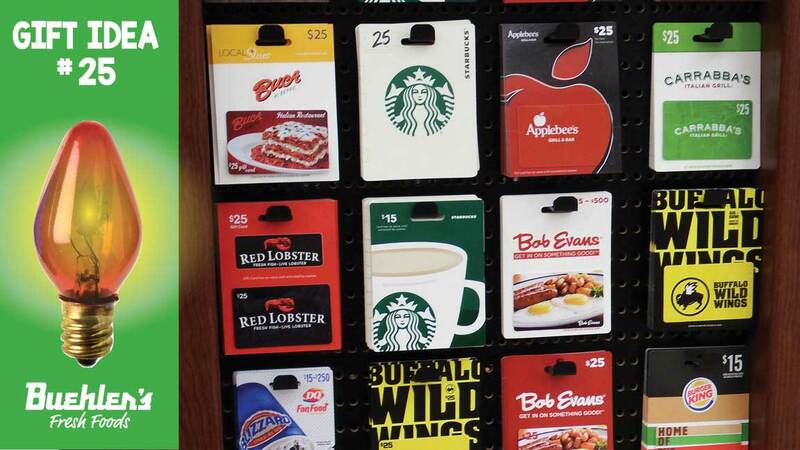 If you have someone who is “tough to buy for” – come check out all the options on our gift card rack! 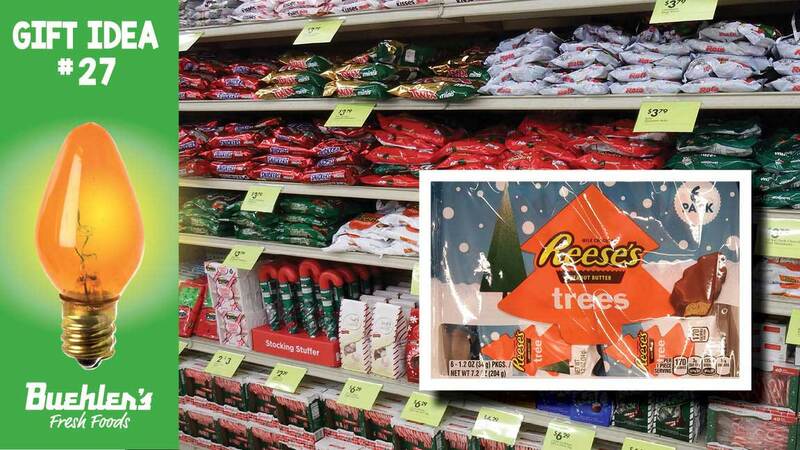 Buehler’s carries over 300 retailer and restaurant gift cards. 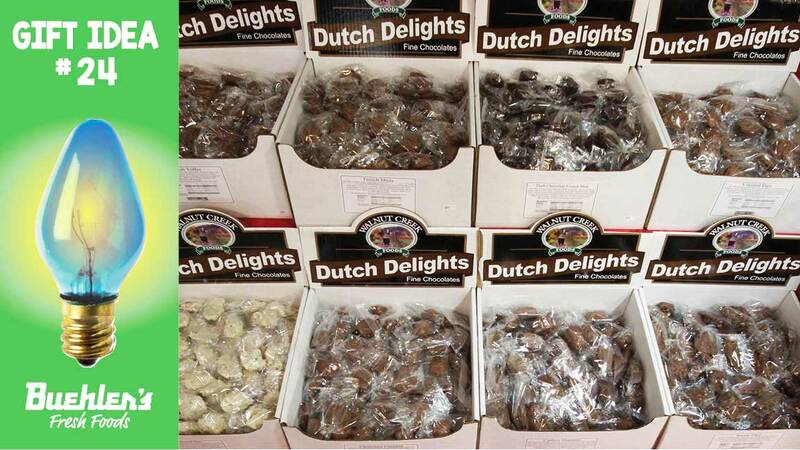 Yes, Virginia, there is a display of Dutch Delights chocolates at Buehler’s. Choose your favorites and enjoy! Oh, wait, this was supposed to be a blog about gift ideas for someone else! If you’ve ever had a Hot Wheels car, you know the thrill of racing down the couch, over the dog and parking in a stray slipper. 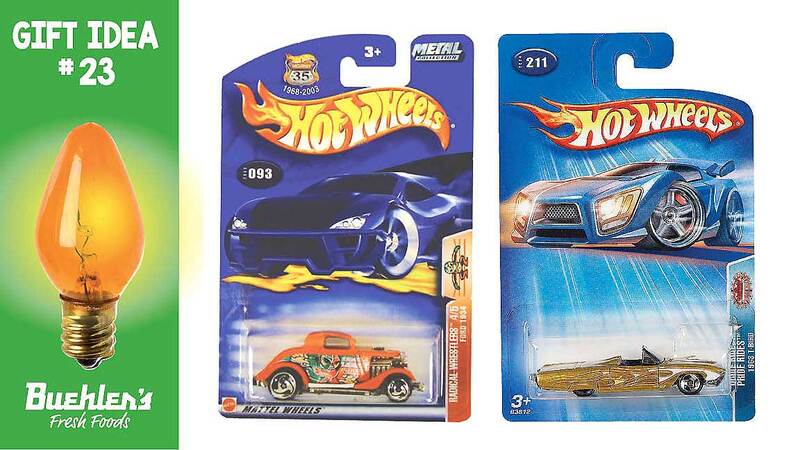 Share the joy of Hot Wheels with someone you love! 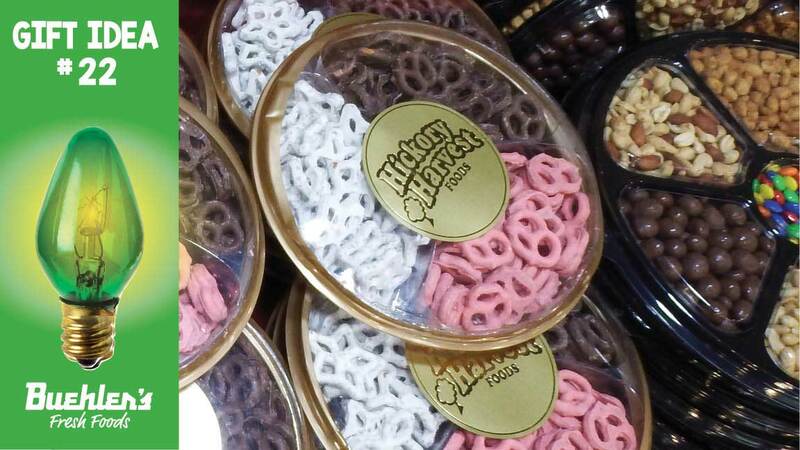 Whatever the “Snacker” on your list likes, you’ll find it at Buehler’s…. The real question is whether or not they’ll share! 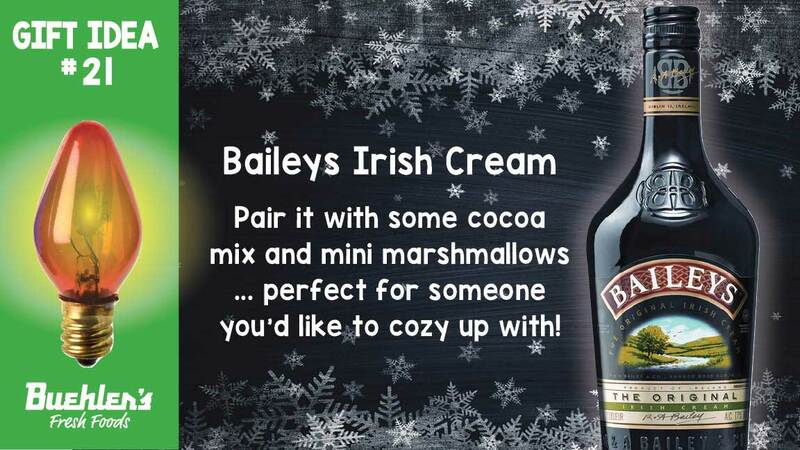 Perfect for pairing with a hot cocoa mix and mini marshmallows as a gift for someone you’d like to cozy up with this winter season! Everyone loves homemade gifts! They are fun to make and delightful to receive. 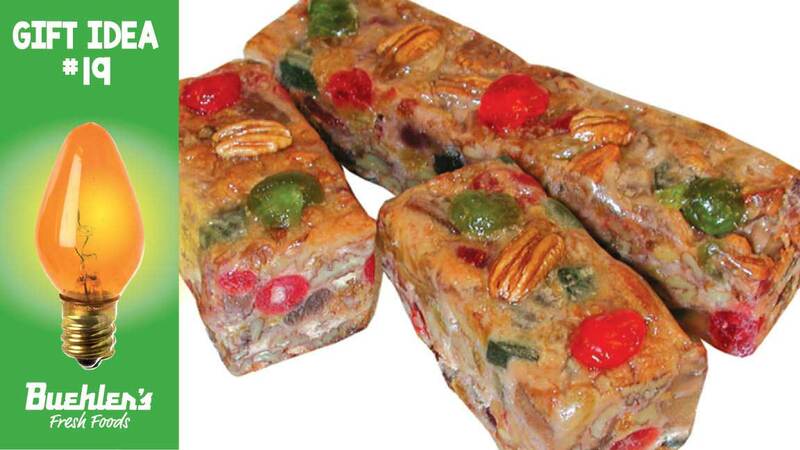 Fruitcake lovers in northern Ohio know, Buehler’s handmade fruitcake is delicious! Give the best to the fruitcake lover in your life. 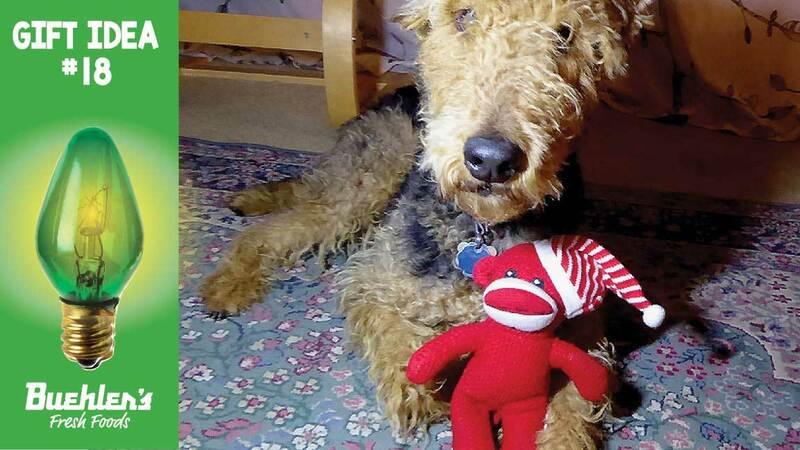 Does Santa bring something special for your pets? 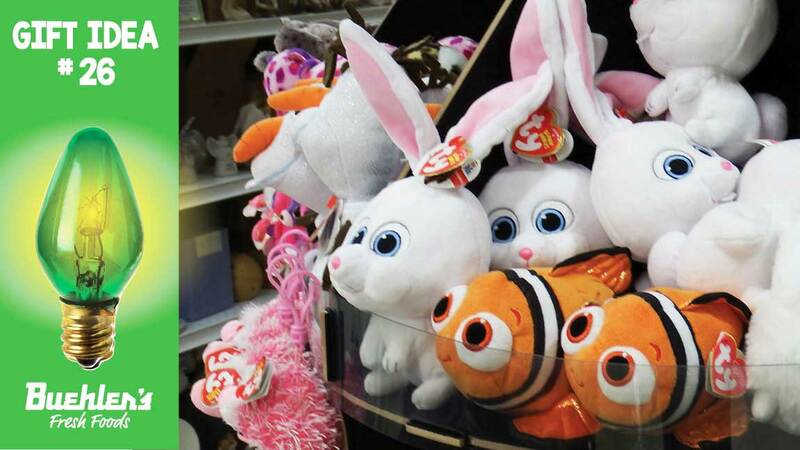 Let Santa know that Buehler’s has cute toys and treats in our pet department! It’s so easy to find your favorite Yankee Candles in Buehler’s Floral and Gift Shop. 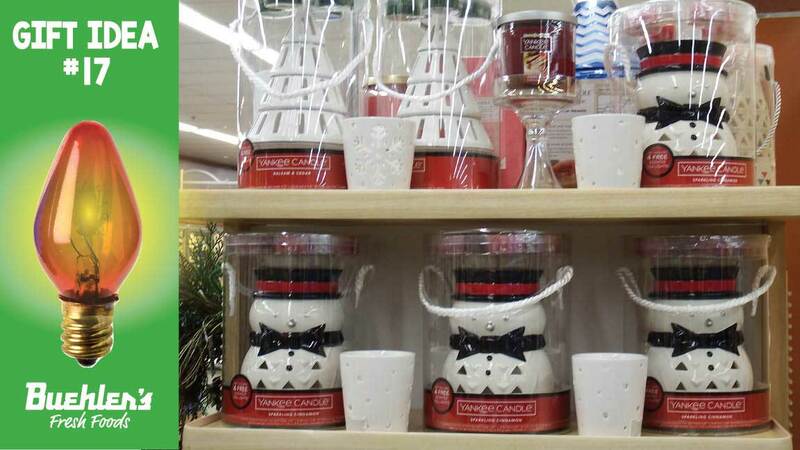 Check out these Snowmen and Christmas Tree holiday candles, along with all your traditional favorites. A wonderful hostess gift, neighborly gesture for a shut-in, or treat for your family! 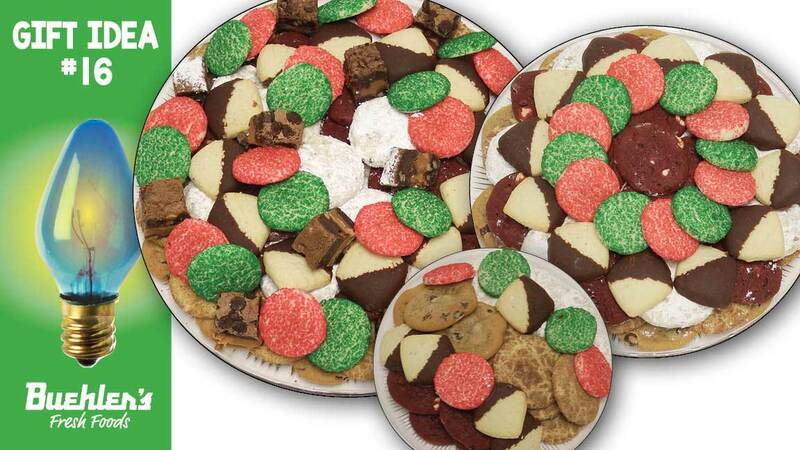 Buehler’s Cookie Trays come in three sizes and all include a variety of holiday cookies. Gift Idea #15 – Ugly Wine Sweaters! 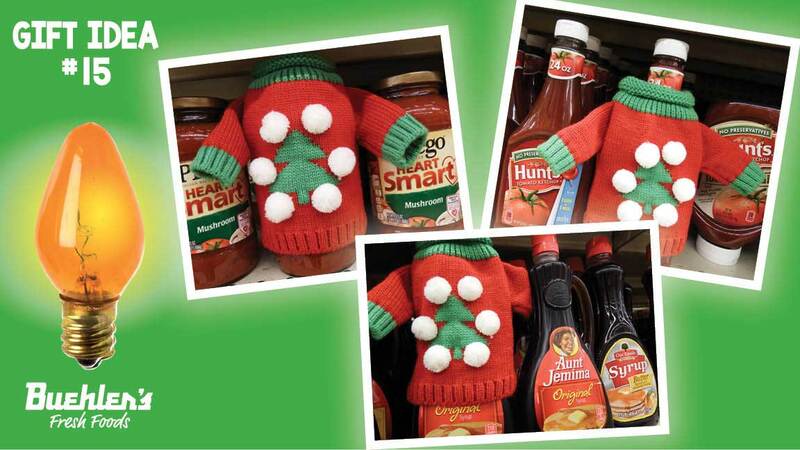 Our Ugly Wine Sweaters are One size fits all – wine, beer, hot sauce, pasta sauce, syrup – any cool foodie gift that comes in a bottle! What gift wouldn’t look awesome wrapped up in a warm, woolly, ugly wine sweater! The wine aficionados and art lovers in your life will be amazed by the beautiful old world alpine village “Starry, Wintery Night” painting appearing INSIDE the bottles of Moselland Ars Vitis Riesling. What a unique design! Our video gives you a 2-D perspective. Stop by our Wine Department and check it out in 3-D.
Our Scenic River K-Cups are the perfect gift for anyone with a Keurig® Coffee Maker — or who might just be getting one this year from Santa! No Keurig machine? No problem! 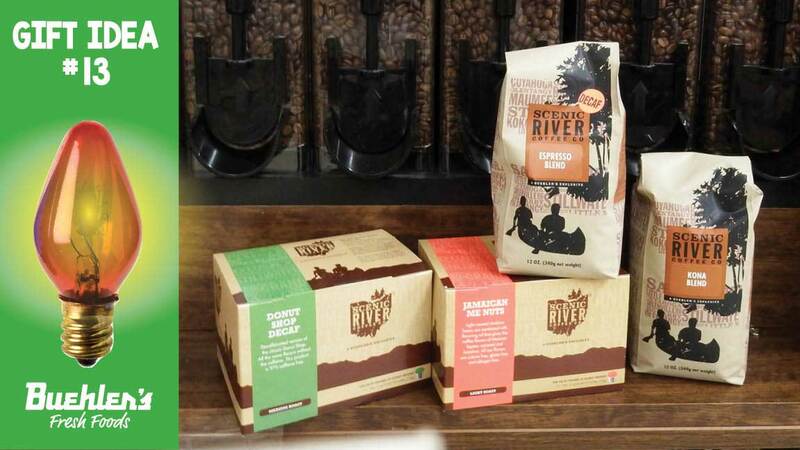 Scenic River coffee also comes in prepackaged bags of ground or whole beans, PLUS lots of whole bean varieties are available for you to purchase in bulk. The perfect gift for any coffee lover! 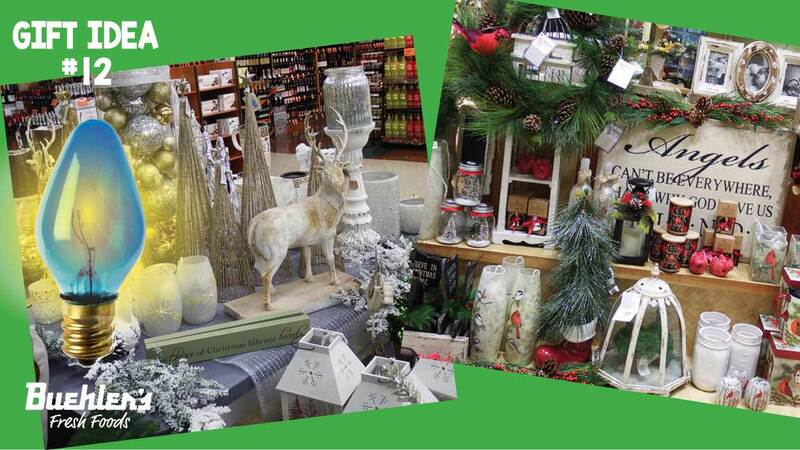 Our beautiful floral-gift department has so many choices! Stop by at see what you can find for someone on your list. 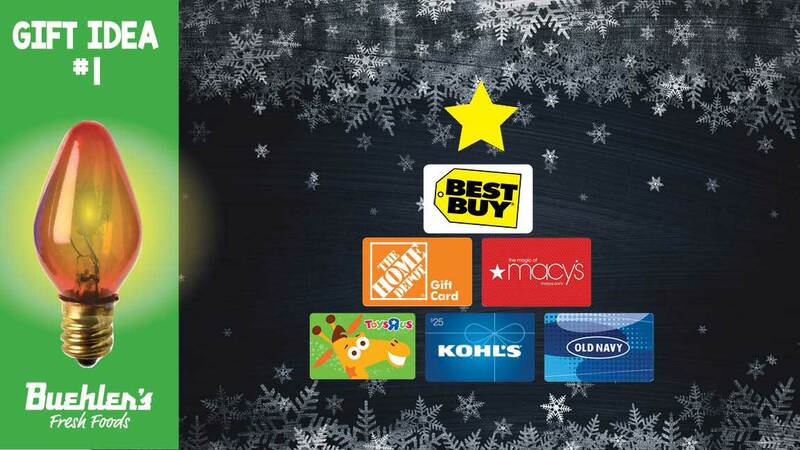 Gift Idea #11 – Gift Cards! Whether to a favorite store or restaurant – or a Buehler’s Gift Card, we have so many to choose! You can even order your gift cards online! 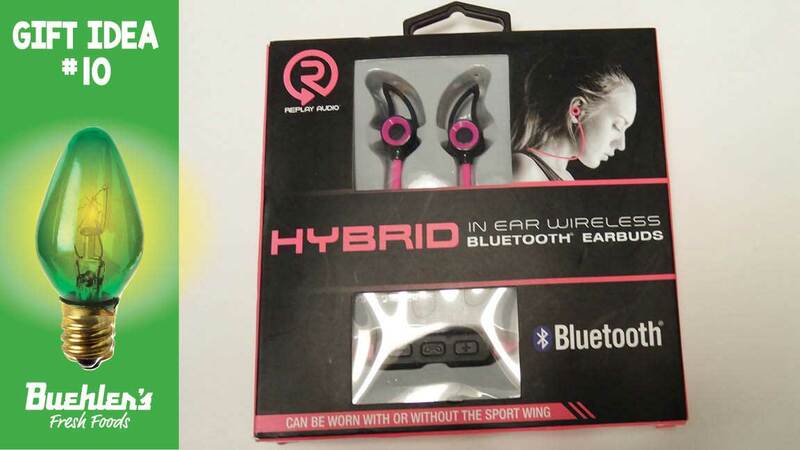 These earbuds are a great stocking stuffer! Who do you know who likes music? Pick up some earbuds at Buehler’s! Yes, Buehler’s carries teeny, tiny, little groceries! 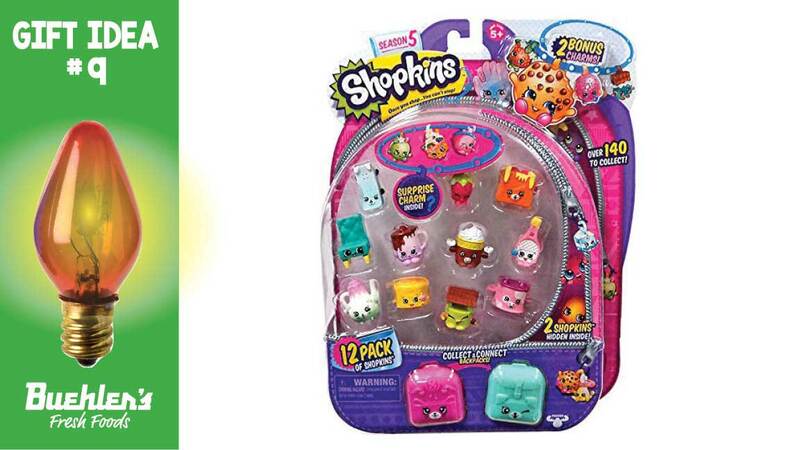 Children love to collect Shopkins! Whose day would you make bright with a poinsettia from our floral department? 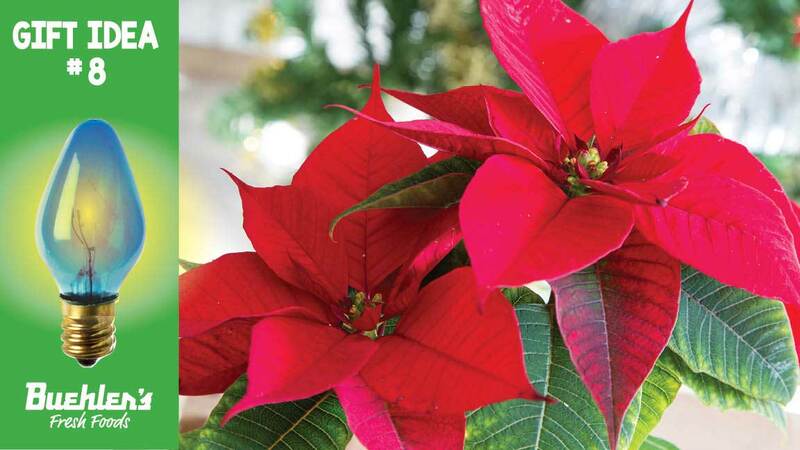 Poinsettias are a great gift for neighbors and friends. 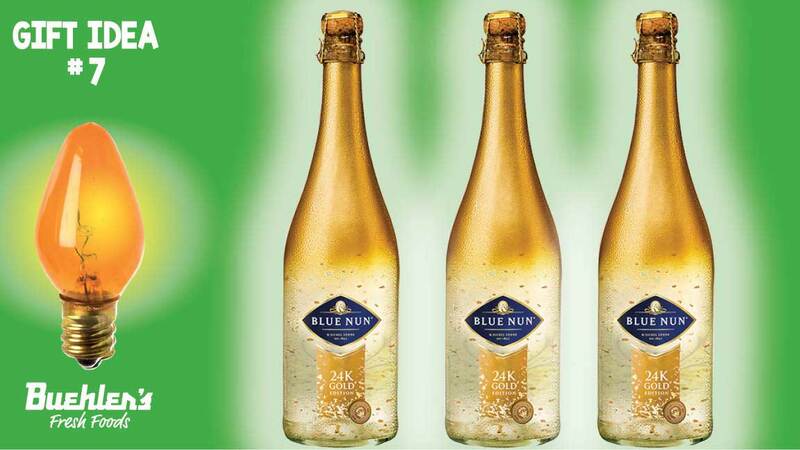 For someone VERY special, Buehler’s wine department has a limited number of bottles of the elusive Blue Nun 24 K GOLD EDITION Sparkling Wine. Effervescent, with fine pieces of 24-carat gold leaf this is the perfect wine for celebrations, special occasions and life’s golden moments. Buehler’s fresh fruit baskets come in lots of sizes, from this Fresh Fruit Sampler to our Ultimate Snack Combo Basket – which is perfect for an office party. 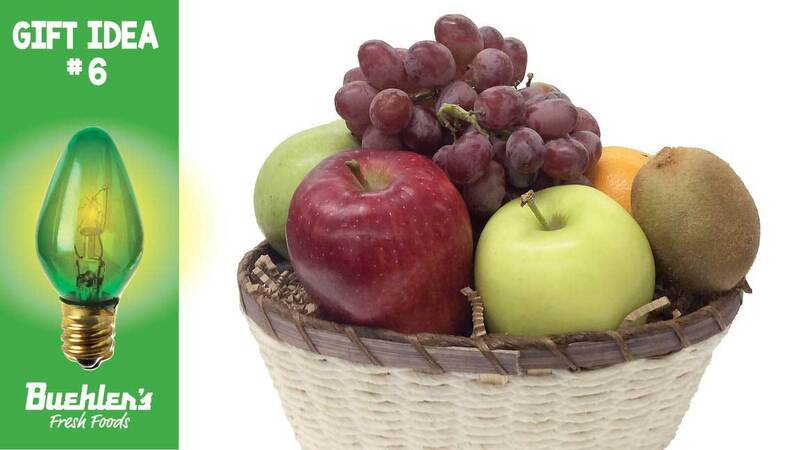 Our fruit baskets are beautiful and so healthy! Click here to see our 2018 Fruit Basket line up. 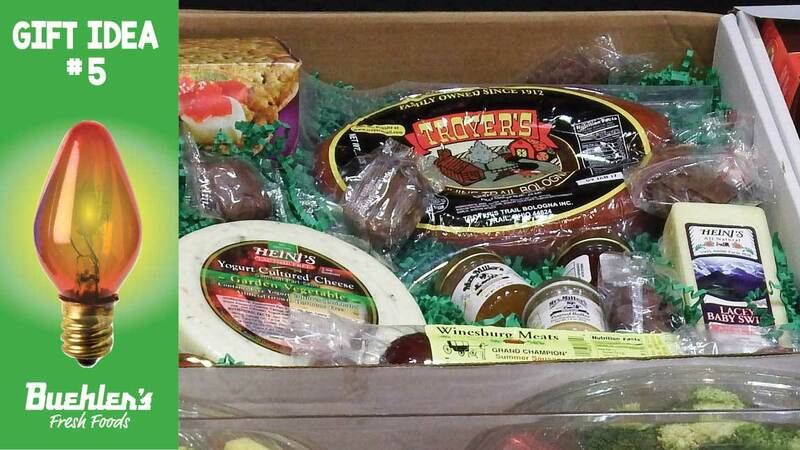 Gift Idea #5 – Gift Box filled with Meats, Cheeses & more! We think food is a perfect gift! And these prepackaged boxes with cheeses, meats, crackers and jams are super easy to wrap. Look for them in our produce department or in our holiday display at the front of the store. Lookin’ sharp! 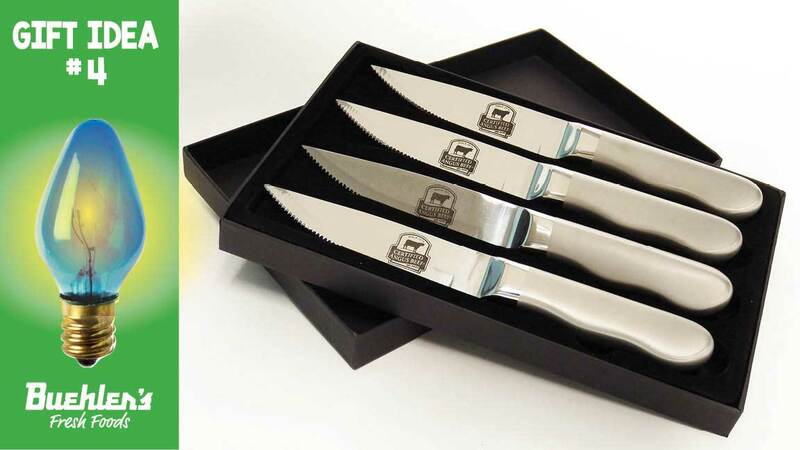 Yes, these stainless steel Certified Angus Beef steak knives are perfect for cutting into a delicious steak! They are available for purchase in our meat department…along with lots of delicious cuts of Certified Angus Beef. 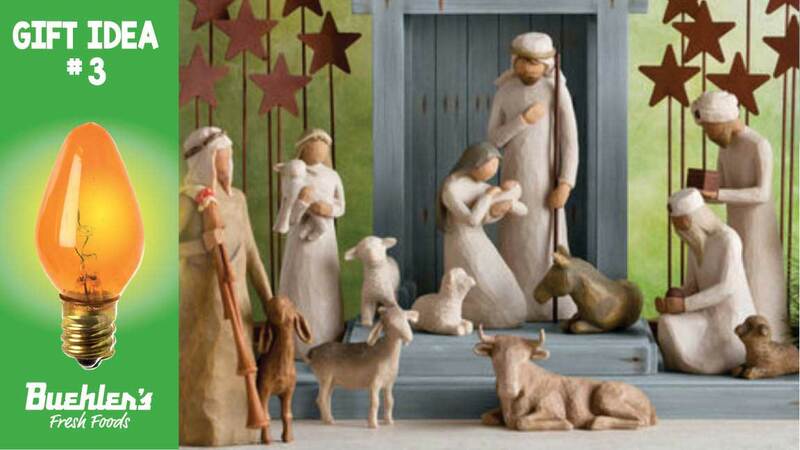 We are so happy to have Willow Tree Nativity Sets available in our gift shop. What a meaningful gift! Brighten someone’s day with a gift they can enjoy throughout the holiday season! 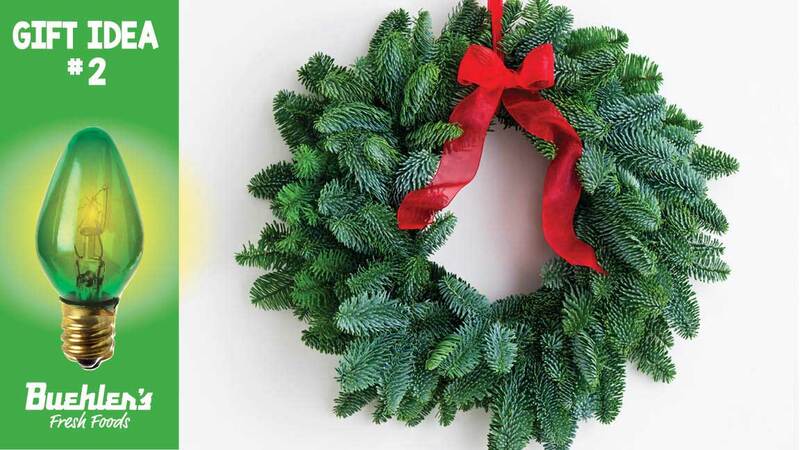 Buehler’s has beautiful, fresh holiday wreaths on display out side our stores. What a perfect gift for teachers, neighbors or special friends! 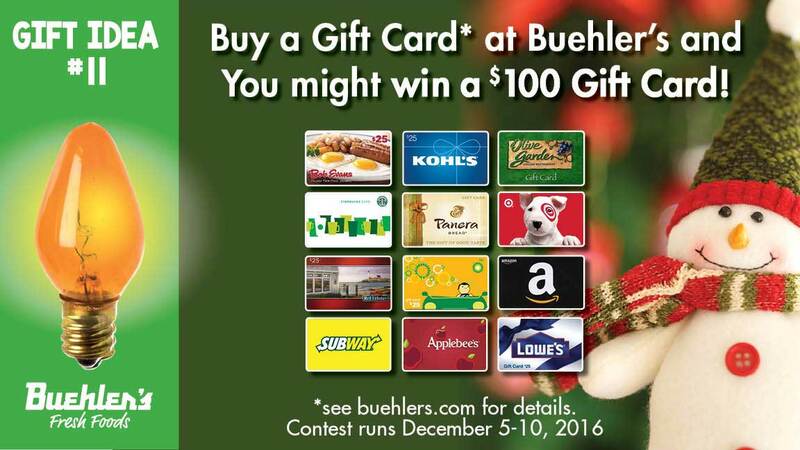 It’s a tradition at Buehler’s – Black Friday through December 10 you’ll earn DOUBLE Rewards when you buy gift cards! We highly recommend “Double Dipping” – purchasing gift cards for stores where you will be buying gifts for friends and family – then using the gift cards to purchase your gifts. Say you’ll be buying a new laptop for your husband at Best Buy. Get a handful of Best Buy gift cards at Buehler’s (and earn Double Rewards) and then use the gift cards at Best Buy to purchase your laptop. Now that’s some smart shopping!